The BLX14 is a popular wireless system for mid-level budgets. It has professional features and professional quality, but without some of the esoteric and often expensive features of touring systems. Its range, sound quality and reliability make it a smart purchase for any number of presentations, from music to business, from art to information. The vocal intelligibility and comfort of this system make it a leader in its class. The BLX1 features a lightweight, ergonomic design and adjustable gain control along with quick and easy receiver frequency matching, TQG connection for use with Shure lavalier, headset, earset and instrument microphones and guitar cables, and an easily accessible On/Off switch. The durable BLX4 single-channel receiver features simple setup, intuitive controls, and microprocessor-controlled internal antenna diversity. One-touch QuickScan frequency selection quickly locates the best open frequency in case of interference. For use with BLX Wireless Systems. Features XLR and Â¼" output connectors and two-color audio status indicator LED. 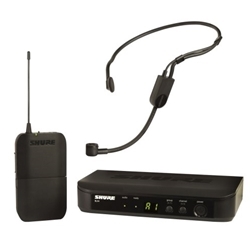 Affordable wireless cardioid condenser headset microphone for speech and vocal performance applications offers long-wearing comfort and reliability. Condenser cartridge with cardioid polar pattern. The new SM35 headset condenser microphone from Shure gives multi-instrumentalists the freedom to express themselves without having to sacrifice the sound quality found in traditional headset microphones. A tight, unidirectional (cardioid) pickup pattern provides excellent rejection of off-axis sound sources and prevents feedback and signal bleed. Standard TA4F (TQG) connectivity seamlessly integrates into any Shure wireless bodypack system. Receiver: 7-7/8 x 6.4 x 1-5/8"